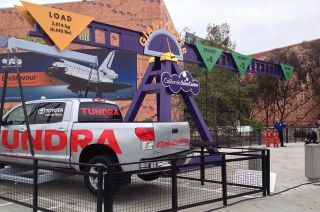 The Toyota Tundra pickup truck that towed NASA's space shuttle Endeavour part of the way to the California Science Center (CSC) in October 2012 is now part of the center's Giant Lever exhibit. The pickup truck that helped to tow a retired space shuttle to its museum display last year is now part of an interactive exhibit designed to demonstrate how to pick up large things. The California Science Center in Los Angeles, which now displays the space shuttle Endeavour, debuted its newly-upgraded "Giant Lever" exhibit Friday morning (May 31), featuring the silver Toyota Tundra pickup truck that helped deliver the massive orbiter to the museum last October. Friday's unveiling wasn't the only "pickup" however, for the science center: Toyota Motor Sales, USA also presented the museum with a check for $401,300, the amount raised during a "tweet drive" leading up to the Tundra's towing of Endeavour. The donated funds are expected to go toward the building of the shuttle's permanent home, the planned Samuel Oschin Air & Space Center, where Endeavour will be displayed vertically, mated with rocket boosters and an external fuel tank, as it looked when on the launch pad. NASA retired the space shuttle Endeavour two years ago following its 25th and final flight into space, which ended with an early-morning landing on June 1, 2011. More than a year later, after making the orbiter safe to be displayed, the space agency ferried the vehicle to Los Angeles atop a modified Boeing 747 jumbo jet. Endeavour's 68-hour, 12-mile road tripfrom Los Angeles International Airport (LAX) to the California Science Center in October 2012 was mostly accomplished atop a NASA overland transporter powered by four computer-controlled vehicles. However, there was a short, but pivotal, stretch of the journey where the transporters could not be used. "One of the biggest [challenges] was crossing a bridge over the 405 interstate," Frank Dominy, a project engineer with the Sarens heavy lifting and transport company, told Air&Space magazine. "California doesn't allow the type of equipment we use, so we had to move the shuttle over to different equipment just to cross the bridge." "That's where Toyota filmed a commercial — they towed [Endeavour] across with their pickup truck," Dominy said. Toyota, which prior to the tow extensively tested its truck to make sure that it was up to the job, used a stock 2012 Tundra CrewMax half-ton pickup, identical to the model it was selling at its dealerships. No additional modifications were made to increase the Tundra's towing capacity or to generate more power, company officials said. Driving the Tundra for the tow and TV shoot was precision driver Matt McBride, who previously appeared in other ads for Toyota and in feature films. McBride's passenger for the short drive was former NASA astronaut Garrett Reisman, who flew aboard Endeavour in 2008. On Friday, Reisman attended the Tundra's unveiling as part of the California Science Center's lever exhibit. Toyota's advertisements featuring Endeavour ran in print and on TV soon after the shuttle rolled into its temporary home inside the Samuel Oschin Space Shuttle Pavilion at the science center. The car company included a new cut of the TV commercial as part of its post-show for the 2013 Super Bowl. Toyota's participation transporting Endeavour continued a partnership between Toyota Motor Sales and the California Science Center to raise awareness of the space program and to educate the public through exhibits and programs. In support of its role in Endeavour's museum delivery, the car company created a website where the public could get a look at the behind the scenes preparations for the towing and send re-tweets through Twitter promoting the move. For each tweet site visitors sent, Toyota announced it would donate $50 to the California Science Center, up to the first 10,000 tweets. A total of 8,026 re-tweets were sent. Michael Rouse, vice president of diversity, philanthropy, and community affairs for Toyota Motor Sales, USA presented California Science Center president Jeffrey Rudolph with $401,300 as part of Friday's event. Click through to collectSPACE.com to see more photos of space shuttle Endeavour’s Toyota Tundra installed in the Giant Lever at the California Science Center. And see shuttles.collectspace.com for continuing coverage of the delivery and display of NASA's retired space shuttles.